It is demonstrated that (3Z)-nonenal (NON) and (3Z)-hexenal (HEX) are oxidized in a cascade by lipoxygenase (LOX) and hydroperoxide peroxygenase (HP peroxygenase) into (2E)-4-hydroxy-2- nonenal (HNE) and (2E)-4-hydroxy-2-hexenal (HHE), respectively. In turn, HNE inactivates LOX terminating the cascade. The hydroxy-alkenals produced serve to inhibit plant pathogens, which initiated the cascade. In addition to LOX, other unknown oxygenases may be involved in the cascade. Using a cloned hydroperoxide lyase (HP lyase) preparation from alfalfa Nordermeer et al. reported that (3Z)- nonenal (NON) autoxidized to (2E)-4-hydroperoxy-2-nonenal (HPNE), and (3Z)-hexenal autoxidized to (2E)-4- hydroperoxy-2-hexenal (HPHE) in the absence of lipoxygenase (LOX) and hydroperoxide peroxygenase (HP peroxygenase). They reduced HPNE and HPHE by NaBH4 to (2E)-4-hydroxy-2-nonenal (HNE) and (2E)-4- hydroxy-2-hexenal (HHE), respectively, for analysis. As first reported by us, there certainly exists autoxidation of NON and HEX, but very feebly, as carefully determined and discussed in the publication using Vica faba preparations  1, as well as, Glycine max (soybean) preparations  . On the basis of the work of Noordermeer et al. the so-called “autoxidation-only theory” was adopted by Schneider et al. evidently without examining the proof of enzyme action involved. Unfortunately, the “autoxidation-only theory” may have prejudiced all future research. In the work of Noordermeer et al. the concentration of NON and (3Z)-hexenal (HEX) was 0.025 mM, which was incubated for 1 to 1.5 hr. In some experiments this resulted in HNE as NaBH4-reduced HPNE at a maximum of about 50% conversion from NON. In research with Vica faba membrane preparations  the concentration of NON was 40-fold higher at 1 mM, and the conversion to HNE was almost complete after only 5 min. at 23˚C giving about 45% yield of HNE. As shown by Gardner and Hamberg  , the membrane preparation inactivated by boiling water for 5 min. resulted in nearly undetectable NON conversion to HNE. If significant HPNE was formed in the heat-inactivated preparation, it would be partially detected by our method   . Other experiments used either triphenylphosphite or triphenylphosphine reduction to detect HPNE   . The disappearance of NON in heat-inactivated preparation was attributed to reaction as Schiff base with inactivated protein. With soybean Glycine max preparations  the concentration used was 40- to 80-foId higher (1 to 2 mM) than used by Noordermeer et al.  . With a 9,300 g supernatant of soybean and 2 mM NON conversion was nearly complete at 25˚C within 5 min. at 15% yield of HNE, whereas the preparation inactivated at 80˚C for 15 min. was inactive. That the soybean activity mainly resided in the 200,000 g membrane fraction of soybean was shown by a 19% conversion of 1 mM NON within 15 min; whereas, the soluble fraction gave only a 3.3% conversion. Actually, the soluble fraction converted NON and HEX into mainly (2E)-nonenal and (2E)-hexenal, respectively. Heat-inactivated membrane fraction gave only 1.2% yield of HNE after 15 min., and buffer afforded only 0.7% HNE. If one considers these latter two values to be mainly due to autoxidation, extrapolation to one hr. gives 0.048 mM and 0.028 mM HNE, respectively. Of course, the conditions are different than used by Noordermeer et al.  . In our experience it is completely logical that Noordermeer et al. detected autoxidation of NON under their conditions of low NON concentration and long incubation times. Water or buffer alone should cause autoxidation of 0.025 mM NON in 1 to 1.5 hr. In the discussion to follow there is a strong indication of an enzymatic component to the oxidation of NON and HEX. Early experiments with soybean, Glycine max, preparations (Triton-100R, pH 7.5 10,000 Xg) (9S, 10E, 12Z)- 9-hydroperoxy-10, 12-octadecadienoic acid (9S-HPOD) was converted into the expected HP lyase product, 9- oxononanooic acid, but only traces of nonenals  . The absence of nonenals was accounted for as the appearance of HNE. (13S, 9Z, 11E, 15Z)-13-Hydroperoxy-9, 11, 15-octadectrienoic acid (13S-HPOT) as a substrate produced HEX, which peaked after only 2 min. reaction and then rapidly decreased to undetectable. In later reports HEX was shown to be converted into (2E)-4-hydroperoxy-2-hexenal (HPHE) and (2E)-4-hydroxy-2-hex- enal (HHE) by soybean preparations  , as well as, Vica faba membrane preparation  . Several reports were published concerning HP peroxygenase  -  . Since NON could be both a LOX and a HP peroxygenase mimic substrate, it seemed plausible that a dual process was at work. Chemically 3, 4-epoxy-nonanal was rearranged to form HNE  . Thus, a dual pathway involving LOX and HP peroxygenase was postulated  . In Hamberg’s lab initial experiments with NON and a soybean LOX-1 (Sigma Type V) preparation were frustrating indicating a slow autoxidation was occurring (this result was clarified in later research discussed below). Hamberg suggested a membrane preparation of Vicia faba known to contain HP peroxygenase and LOX. This membrane preparation proved that NON was converted to HNE enzymically with heat-inactivated membrane producing much less conversion (very little autoxidation)  . The supernatant fraction was active, but much less so, and buffer only was ineffective  . In this work we isolated both HPNE and trapped 3, 4-epoxynonanal with NaBH4 reduction furnishing stable 3, 4-epoxynonanol  . It was also shown that HEX was converted to HHE. In addition to NaBH4 trapping of 3, 4-epoxy-nonanal, it was demonsrated that HP peroxygenase was involved by use of several experiments. Preincubation with H2O2 is known to inactivate HP peroxygenase, and such a H2O2 preincubation experiment produced about 50% less HNE as triphenylphosphite reduced HPNE. And, the HP peroxygenase co-substrate, oleic acid, reduced the conversion of NON to HNE with the simultaneous appearance of 9, 10-epoxyoctadecanoic acid. Also, the addition of [13-18O2]-(13S, 9Z, 12E)-hydroperoxy-9, 12-octadecadienoic acid ([13-18O2]-13S- HPOD) both inhibited HNE formation and labeled HNE with 18O. Takamura and Gardner  preincubated a 9,300 g supernatant from soybean with H2O2 and demonstrated that NON was converted into HPNE by TLC of the product, which was isolated from TLC, reduced by triphenylphosphine, and rechromatographed to correspond to a HNE standard. Thus, it was clearly demonstrated that the Vicia faba and Glycine max membrane preparations produced HNE from HPNE by HP peroxygenase. Table 1 summarizes the conversions of substrates to products by various preparations. As discussed briefly above, it was demonstrated that soybean Glycine max preparations were giving similar results  using both HEX and NON. The pH optimum of HNE and HHE formation at 9.5 was suspiciously similar to soybean LOX-1 pH optimum. HEX was much less active, which one would expect with LOXs given the ⱳ3 double bond of HEX. In further work  it was demonstrated that soybean LOX-1 activity and NON oxidation activity co-eluted by DEAE Sephadex column chromatography. It required a relatively large amount of LOX-1 to produce mainly (2E)-4-oxo-2-nonenal and less HPNE. This was reminiscent of the formation of 13-oxo-octadecadienoic acid and (13S, 9Z, 12E)-hydroperoxy-9,12-octadecadienoic acid (13S-HPOD) with LOX under partial anaerobic conditions   . The latter report implied that HPNE was inefficient at forming the Fe3+ form of LOX. It seemed that the reaction needed a lipid hydroperoxide to “prime-the-pump” of native Fe2+  . By adding a small amount of 13S-HPOD, NON was efficiently oxidized to HPNE. That the reaction was caused by LOX-1 was demonstrated by showing that the recovered HNE was 83% S-configuration as expected. NON was also oxidized by other LOX isozymes isolated by column chromatography. LOX-3 gave HPNE at 55.5% and 71.4% 4S-stereoconfiguration at pH 8.6 and 6.5, respectively. LOX-2 resulted in HPNE with 60.8% and 86.5% 4S-stereoconfiguration at pH 8.6 and 6.5, respectively. This result with LOX-2 was close to the 75.1% 13S-HPOD obtained at pH 6.6 with linoleic acid oxidation  . Soybean LOX-3 afforded nearly racemic R, S-9-and 13-HPOD products from linoleic acid, which did not thoroughly coincide with the HPNE result. Yet other studies showed that HP lyase product of 13S-HPOD, 12-oxo-9Z-dodecenoic acid, was converted into 12-oxo-9-hydroxy-10E-dodecenoic acid by both soybean and alfalfa seedling preparations  . Nakashima et al. identified 12-oxo-9-hydroxy-10E-dodecenoic acid as a glyceride component of galactolipid. Noordermeer et al. reported that 12-oxo-9Z-dodecenoic acid was autoxidized to both 12-oxo-9-hydroxy-10E-dod- ecenoic acid and 12-oxo-11-hydroxy-9Z-dodecenoic acid. Counter-intuitively, HNE inhibits soybean LOX-1  probably by reacting with essential amino acid (s). LOX has three histidines as ligands to the iron active site   It is known that histidine is particularly susceptible to reaction with HNE  . It seems certain this inhibition is a feed-back mechanism. That is, after wounding by a plant pathogen LOX produces HPOD/HPOTs, which are both substrates and promoters of hydroxy-alkenal formation. In turn, the build-up of hydroxy-alkenals then turns off LOX oxidation of linoleic acid, linolenic acid, and alkenals preserving the plant but inhibiting invaders. Deighton and coworkers   showed high concentrations of HNE (4 to 20 nmol・g−1) in fruit of sweet pepper infected by Botrytis cinerea. In certain experiments HNE was as high as 30 nmol・g−1 (Deighton, N., personal communication, unpublished). Interestingly, the senescence hormone, methyl jasmonate, up-regulated 13-LOXs and HP lyase in barley leaves leading to 15 nmol・g−1 of endogenous HHE after 48 hrs  . Table 1. Summary of NON and HEX oxidations. LOX: Lipoxygenase/Oxygenase; HPP: Hydroperoxide peroxygenase; H2O2-HPP: H2O2 inhibited Hydroperoxide Peroxygenase; LOX-1: Soybean Lipoxygenase-1 isolate. Scheme 1. Oxidative cascade of plants. 65% 4S-HNE (Gardner, H.W., unpublished). Future research should be pursued to better understand the role of LOX isozymes and HP peroxygenase in stereo-selectivity. Since pH 6.7 buffer was used with the V. faba preparation, it is plausible that more than one LOX isozyme was present. LOXs with optimal activity at neutral pHs are known as type-2 LOXs, and these enzymes often result in HPOD with a mix of regio-and stereo-isomers. At pH 6.5, even soybean LOX-1 gave a mix of regio-and stereo-isomers  . In membrane preparations of Vicafaba and Glycine max it is likely that endogenous lipid provides the hydroperoxide to “prime the LOX pump”, thus starting the oxidative cascade. 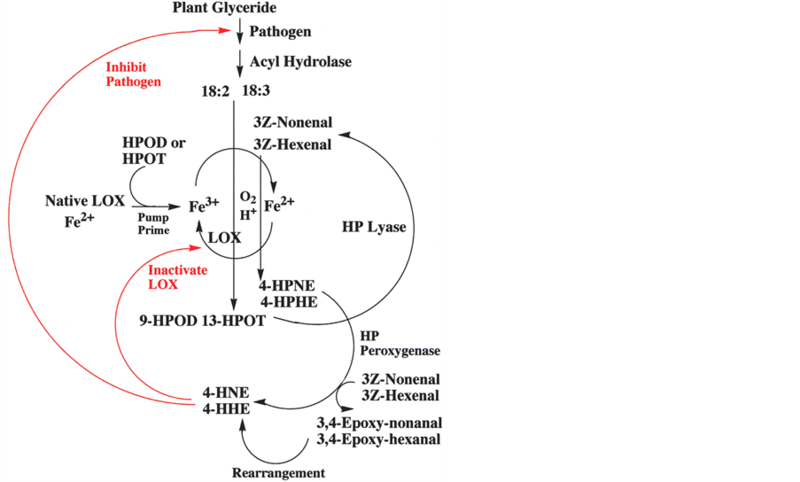 Scheme 1 summarizes the hypothesis that the oxidative cascade to 4-HNE and 4-HHE plays a role in the physiology of plants. It was shown adequately that HP peroxygenase plays a role in the cascade. Although soybean LOX-1 is capable of forming HPNE with the expected S stereo-configuration, the oxygenase portion of the cascade is not totally clear. With Vica faba membrane preparations  the apparent inaction of LOX was shown by the inaction of LOX inhibitors, 5, 8, 11, 14-ecosatetraynoic acid and nordihydroguaiaretic acid. Also, in the soybean membrane preparations Takamura and Gardner  showed that there was about 50% inhibition by LOX inhibitors, 5, 8, 11, 14-eicosatetraynoic acid and salicylhydroxamate at pH 6.5, but not at pH 9.5 where LOX-1 has optimum activity. The lack of effect by LOX inhibitors was a confounding result that suggests additional research is needed. It is plausible that an aldehyde oxygenase also may be involved. 2. Gardner, H.W. and Hamberg, M. (1993) Oxygenation of (3Z)-Nonenal to (2E)-4-Hydroxy-2-nonenal in the Broad Bean (Vica faba L.). Journal of Biological Chemistry, 268, 6971-6977. 10. Blee, E. and Schuber, F. (1990) Efficient Epoxidation of Unsaturated Fatty Acids by a Hydroperoxide-Dependent Oxygenase. The Journal of Biological Chemistry, 265, 12887-12894. 13. Gardner, H.W., Weisleder, D. and Plattner, R.D. (1991) An Enzyme Preparation from Seeds of Soybean Glycine max Converts 9S-Hydroperoxide of Linoleic Acid into 4-Hydroxy-trans-2-nonenal. Plant Physiology Meeting, Albuquerque, NM, 28 July-1 August 1991. 17. Smith, W.L. and Lands, W.E.M. (1972) Oxygenation of Unsaturated Fatty Acids by Soybean Lipoxygenase. The Journal of Biological Chemistry, 247, 1038-1047. 1In the publication of Gardner, H.W. Hamberg, M.  we erroneously named “3, 4-epoxynonenal” in the Abstract, which should be corrected to read 3, 4-epoxynonanal.